Have you ever added time sheets against the wrong job? How annoying is that? Today’s Tip of the Week will teach you how to solve this problem. Luckily, our in-built wizard makes reassigning timesheets to the correct job super easy. Select the job that you would like to move timesheets from, then click the 'Options' button in the bottom left hand corner and select 'Move Time Sheets'. 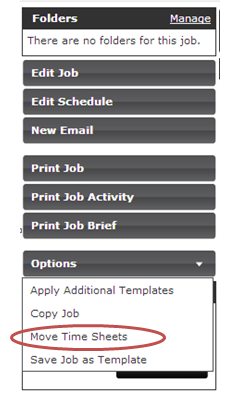 Select the job and timesheets that will be moved. Confirm if the timesheet entry should retain it's billable status (i.e. billable or non-billable) from the previous job, or match the status of the destination task. Once that's done select the task from the drop down list which the time sheets will be moved into and click Save. Important note: Only time sheets that haven't been billed can be moved between jobs. Got any questions? Please let us know at support.